Can you help us record spring flowering plants? Spring has arrived, and with it the National Biodiversity Data Centre is pleased to bring you our Spring Summer 2019 Workshop Programme. Searching for spiders hiding in the crevices. Spider workshop, May 2009. 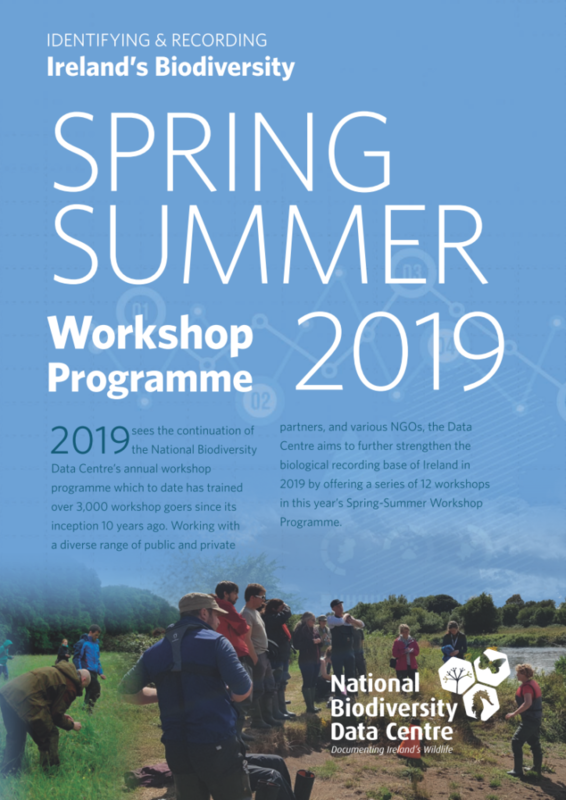 The delivery of an annual workshop programme is a crucial part of the National Biodiversity Data Centre’s role, that aims to support the recording and citizen science network in Ireland, building on and improving Ireland’s recording base. 2018 was an exceptional year for the Data Centre’s workshops, having registered over 420 participants across 24 workshops in total. That brings the total number of people registered for any of our workshops over the course of 10 years since the very first workshop to over 3,000! 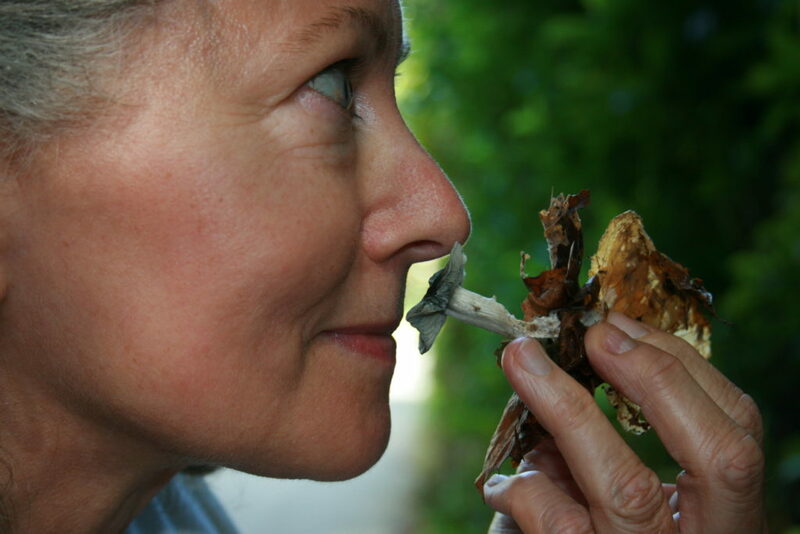 Enjoying the aroma, during a workshop on fungi in 2009. It is very humbling to witness the interest shown in our workshops across the country, and ultimately a willingness by people to learn more about Ireland’s natural heritage. A huge thanks is owed to all those who attended and took part in our workshops over the years, and to all those who the Data Centre had the pleasure of working with since the introduction of the very first workshop programme in 2009. 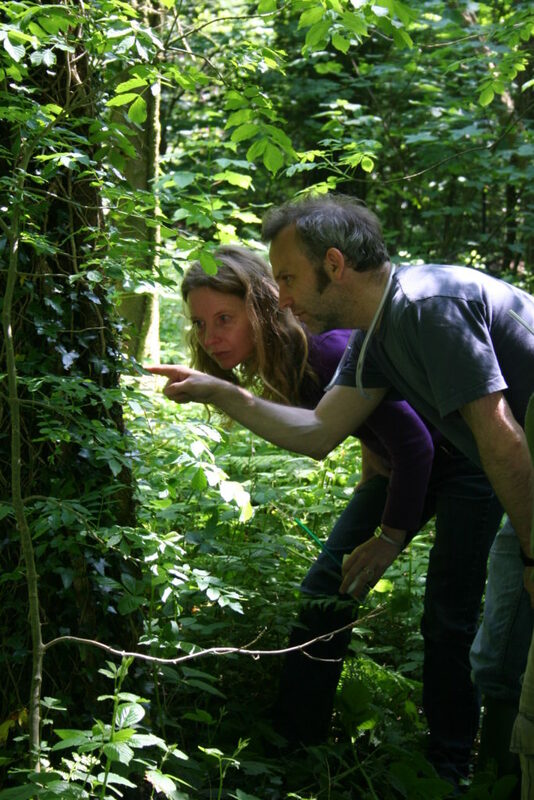 In 2019’s Spring Summer workshop programme, we are delighted to be able to partner up with several organisations and recognised experts from the field of ecology and biological recording to bring you 12 workshops to choose from. Spring Summer 2019 Workshop Programme – click on image to download. Places are limited so advance booking and payment is essential. To book a spot on one or more of our workshops, visit the events section of our website: http://www.biodiversityireland.ie/events/. Please note, you will need your bank card during the booking process to complete registration for any of our workshops. Booking fees per person range from €20.00 for students, to €30.00 for standard attendees. Our professional workshops fee is €50.00. For further information please contact the National Biodiversity Data Centre. You can call us at 051306240, or email us at info@biodiversityireland.ie. The National Biodiversity Data Centre is an Initiative of the Heritage Council and is operated under a service level agreement by Compass Informatics. The data centre is funded by the Department of Culture, Heritage and the Gaeltacht, and the Heritage Council.